All Hodge silk swabs are made from 100% Chinese silk, very absorbent, very compressible to avoid bunching, and lint free. 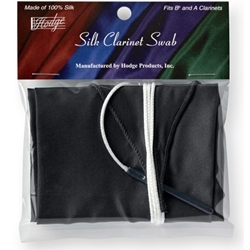 Most Hodge swabs are made using a ball chain, while the saxophone swabs and bass clarinet swabs use a plastic-coated lead weight. Black silk, virtually impossible for the swab to get stuck in the instrument.